The cursor functions allow the user to work with a specific row in the attribute table. Each row is called a record. In many ways, the cursor function is similar to the list function discussed previously, which was used to control files and fields (columns, attributes). There are three cursor functions that will be explored, the insert, update and search. For the cursor function to be used an input table from a shapefile or a feature class file (in a geodatabase) containing field names. The search cursor allows the user to explore the contents of a shapefile or feature class file without opening it in ArcMap Desktop. n Figure 1, the arcpy module is imported and then the environment workspace is set to be the author’s Y drive in a folder named Vince (remember a different path will be needed on the learners workstation). A variable ‘store’ is created for use with the SearchCursor command. The first parameter of the command is the shapefile (feature class for the geodatabase) that will be searched. The second parameter is the field that will be examined. To use this function, the user would need to know the field structure of the shapefile, which could be explored as noted in previous modules. 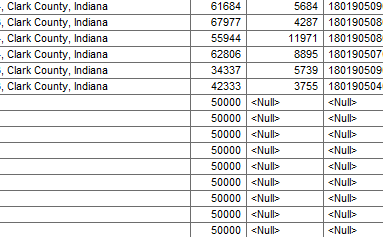 Each value in the field City would be saved in the ‘store’ list variable. To output the results of the ‘store’ variable a for loop has been set-up which will print each member of the City column one line at a time. In Figure 2, only a part of the list shown. All values are printed which includes duplications in different rows. The insert cursor command allows the programmer the ability to insert a row into a shapefile or feature class file, the user does not have to have the file open. To input a single row a loop function would not be used in this example a new statement is being inputted multiple times using the while function, which will be fully explained in the code discussion. Arcpy is imported and the environment is defined, a geodatabase is used for this example. A variable ‘row’ is defined which uses the InsertCursor command, which is part of the data access module (thus the reason that the data is added into the function statement). The next two lines of the script define a counter variable called ‘rows’ and the input value to be written to the Income column. The while command is used note the logic and the colon at the end of the line. The loop is completed as long as the variable rows are less than 10. The value of the variable New_Income is inserted into the Income column each time the loop is executed. At the end of the loop the variable rows are incremented by one and the loop is repeated until the logic is no longer true. See Figure 4 for the results of the process, note that only one field had data inserted which is not make a functional data structure, but does demonstrate the process. has two different names. 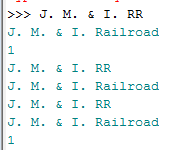 If a user attempted to query for the J. M. & I Railroad (Jeffersonville, Madison and Indianapolis), they would only get part of the record because of the two different formats the railroad is listed. The Update Cursor will be used to make all the names the same. Three different methods will be shown using the same data. Remember if a copy of the data is not made, after the first method runs successfully it will change the data. Thus the errors will no longer exist and cannot be successfully used for the next two demonstrated methods. Figure 7, shows the method 1 scrip and is discussed below. Arcpy is loaded and the environment is set to the geodatabase. The variable ‘row’ is defined with the UpdateCursor. The first parameter is the file name and the second parameter is the field. Note the field name is in square brackets, indicating that a list has been defined. The for loop will be used for the operation with an if statement within. The for loop will ensure that each member of the list variable row is examined. The variable ‘row’ contains all the members from the field Name and each record is examined in the Name field, which will be the same item modified if required. The if statement is comparing the value of the individual cell and determining if it is true or false by what is contained in the quotation marks. If it is false it drops to the else statement, prints a number 1 and returns to the for statement. Stores the value into the cell. The del command was used to delete the variables rows and row. Figure 7 shows the output in which three items were modified and two were unchanged. In the second method shown in Figure 8, the print statements have been removed which shows how the code flows, this code would be more appropriate for production level work, while the previous code is used for learning and troubleshooting. The data file was changed as a result of Method 1 and a new data file is required that contains the errors. To determine if this method if was successful the feature class file in the geodatabase would need to be opened in ArcMap (there are ways to determine this without opening the file). In the third method the with statement will be used. The with statement is used to insure that all locks have been removed from a dataset once the operation has been completed. As noted earlier when certain operations are performed datasets are locked so that no other user can modify the data while being used. When the operation is executed, it is critically important to remove the locks so that the datasets are available to other users. This is of particular importance for files in a geodatabase, but these discussions do not refer to files contained in a relational database. The code shown in Figure 9, uses the with statement. The update cursor statement is part of the with statement and ends with a colon. This will cause all lines after this statement to be indented. The file will be locked until the script returns to the initial indentation level, which will then unlock the file. This example is basically the same code as in Figure 8. It has been slightly modified to use the with statement. The only changed line is the fourth line from the top. Defining the variable row is done differently using the with statement and the colon at the end. The ‘as row’ variable is used instead of the equal sign as before, the equal sign would cause an error to occur. Note all the lines are indented after the with statement and since the script ends after the del statement, there is no returning back to the original indention. This method will insure that the file closes at the end of the operation.